Movie star Sophie Leigh had a reasonably normal childhood growing up in Swindon in England, but you wouldn't be able to guess from her gorgeous mansion in the Hollywood hills, regular work-outs with a personal trainer to keep her already ultra-thin body in shape or the slew of gorgeous men she's rumoured to be dating at one point or another. Known for playing slightly ditzy characters in romantic comedies no-one takes her serious when she exclaims she wants to do something different, but Sophie is determined to show everyone that she's a better actress than she's been given credit for and at the same time fulfil a lifelong dream by making a film about her own screen idol, Eve Noel. Eve was a glamorous actress in the 1950s who made several critically acclaimed films, one of which she was even nominated for an Oscar for. Yet despite seemingly having it all, she was deeply unhappy in the world of Hollywood and she disappeared without a trace after finishing her very best work, A Girl Named Rose. Sophie has seen Eve's films hundreds of times and practically knows the other actress' biography by heart. She's endlessly intrigued by the life of Eve and the mystery surrounding her disappearance, and as Sophie digs deeper into the other woman's past, secrets start to unravel and their worlds collide in unexpected and dangerous ways. This novel was not what I was expecting at all, but in a good way. The present storyline at first reads like and average chick-lit with at its core a beautiful and perfect young woman, who despite her fame and riches is still very down to earth and sweet. This would be incredibly grating and unbelievable if it weren't for the fact that despite the world Sophie lives in, she is a very self-aware and likeable and it was a joy to read about her fresh perspective on the otherwise overly botoxed and tanned world that we refer to as Hollywood. And then there is the mystery of Eve Noel. In flashback chapters the reader gets a rare insight into the actress' life, which has always been so carefully hidden from the public eye, until slowly yet steadily cracks start to appear. And as her story moves into a darker territory so does that of Sophie. What follows is a really intense journey for both the characters and the reader and I was on the edge of my seat as the story started to unravel; I was physically unable to put the book down, because I needed to know how it would end. I was endlessly fascinated by the insights into the Hollywood life, both in the past and present time, as given in this novel. I know it is a piece of fiction but having read that the character of Eve Noel is loosely based on screen legend Vivienne Leigh does make me wonder what else in the novel came from facts or rumours. It really isn't so hard to imagine that some of the horribly manipulative and deceptive practises mentioned have and still are being conducted by the power hungry and wealthy in LA, or those who feel they need to hide who they truly are and love. It's a scary thought, but perhaps the exposure, even if it is in the form of fiction, is exactly what's needed to kick-start some much-needed changes. 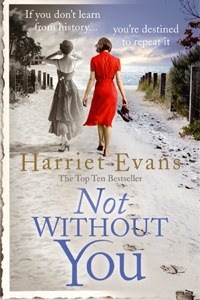 Intriguing, intense and immensely gripping, Not Without You is a thought-provoking novel, which will linger with the reader long after turning the final page. You can order your copy from Waterstones, Amazon.co.uk, Amazon.com or your own preferred retailer.